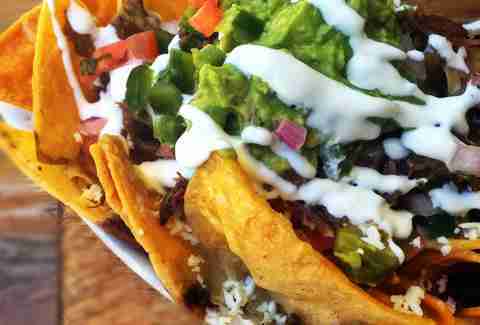 In a city like New York, not commonly known for its Mexican food (which is total crap), finding the best nachos can be incredibly difficult... unless you read this story, which makes it incredibly easy. There are many nominees for most likely to need a napkin, but only one official winner, and it’s Taco Chulo’s Nachos Chulos. 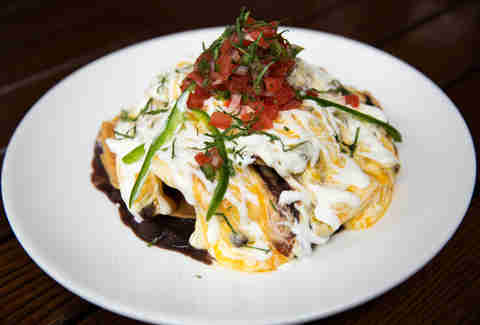 As a constituent of the cheese sauce community, Taco Chulo’s namesake ‘chos pour on the orange cheese generously along with crema, pico de gallo, and fresh guacamole. When presented with a sheet tray filled with nachos, do not be alarmed. Instead, be proud of future you, who will have eaten these nachos. 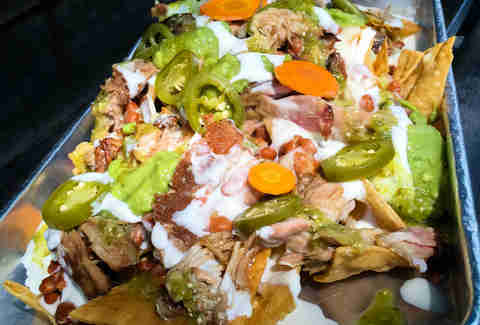 At Taqueria Diana they begin with great freshly fried homemade chips then pile on beans, white cheddar, jalapeños, carnitas, crema, and heaps of guacamole. Instead of forcing a spice level, salsa verde, salsa rosa, and a habanero salsa are waiting for you in bottles on the side. 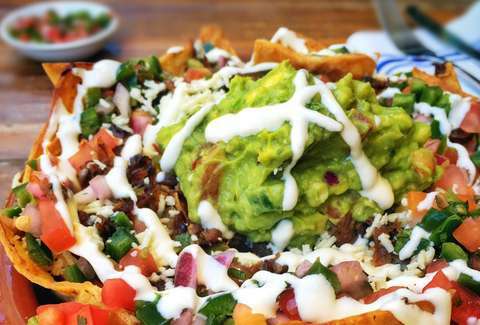 This is the only nacho place around that somehow gets away with throwing broccoli and zucchini on chips (we’re gonna go ahead and say it probably has something to do with them also engulfing them with black beans, cheese, heaps of guacamole, and pico de gallo). 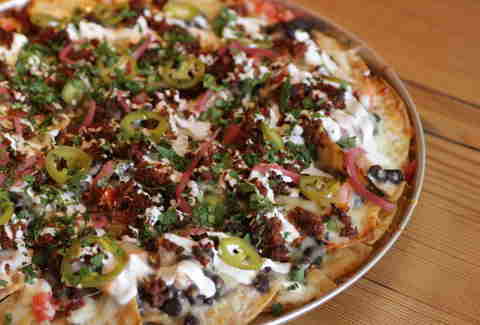 Oh, and the menu boasts another five types of delicious nachos, in case you’re in a nacho takedown kinda mood. 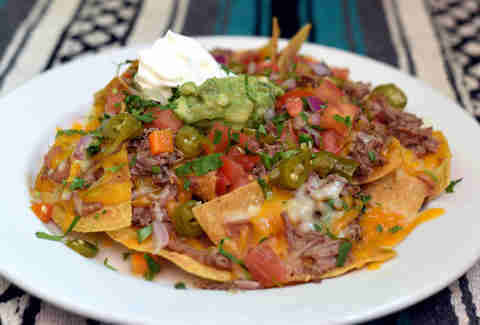 A buzz-worthy Tex-Mex restaurant, Javelina’s nachos feature an approachable mound of chips with refried beans and brisket covered with a blend of cheddar and Monterey Jack and hefty dollops of pico de gallo, sour cream, and chunky guacamole on top. Also, yep, the place has Shiner. El Camion Cantina cheats on its melted three-cheese blend with sprinkles of cotija cheese (aka FOUR CHEESES! ), then drizzles of crema, a scoop of guacamole, and pickled jalapeños. Not a misnomer, these super-sized nachos feature a deliciously spicy cheese sauce, three salsas (verde, roja, and chile de arbol), quality chips, and a hearty sprinkling of radish and cilantro. El Vez has a unique technique for keeping its nachos from getting soggy: instead of piling high, El Vez goes wide, serving an almost pizza-like nacho that’s served on a tray and pizza stand. Every part of the platter gets a handful of chorizo, Jack cheese, pickled red onion, and jalapeños. 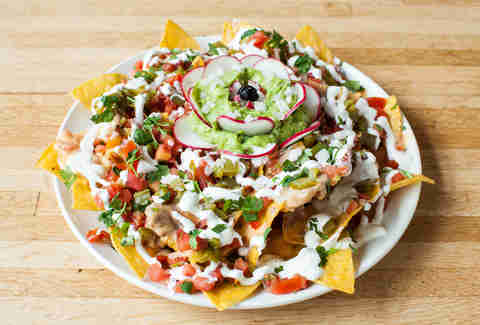 An absolutely prototypical bar-style nacho and easily the largest quantity of them probably allowed by law, Professor Thom’s serves its nach-es on a pizza tray on a cake stand. These will feed your team and the team you’re rooting for, but beware -- this is a Red Sox bar. Chips are piled high with ever-present cheese, healthy helpings of guacamole and pico de gallo, and a separate cup of mild salsa. Only being available at happy hour makes these nachos the most mysterious of the bunch. Why not serve them all the time? Is this too much goodness for the regular menu? These nachos boast homemade chips, Oaxaca and queso blanco cheeses, and crema, plus you should definitely go for the chorizo.